1. How long have you been working on iNymbus? The idea started in 2011, but it took us two years to formulate, so very actively from 2013 onward. 2. How has your role since you started? The biggest challenge when we started iNymbus was it’s so revolutionary for people to understand. We call it product-market fit. The market is beginning to accept the way we give them the solution. We had one customer in 2013, which was Warner Brothers. It has been a slow process, but the growth is accelerating. 3. What do you like about iNymbus? It is a revolutionary way of solving a problem. 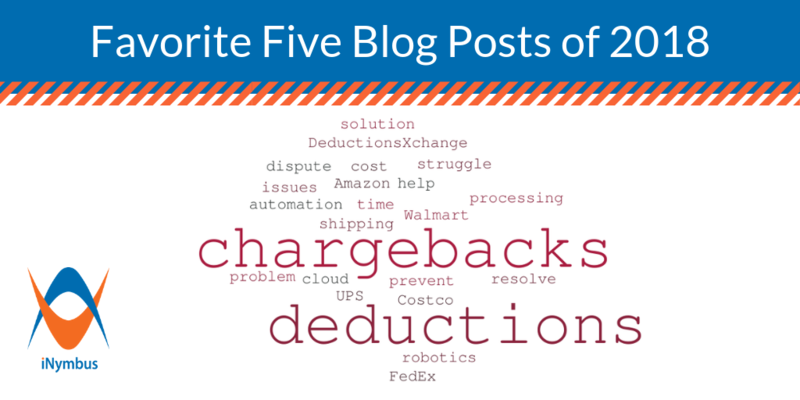 While there are software or outsourcing companies that “solve” the chargeback and deduction challenge, there are usually two things going on. The first is a software company will sell a product, whether it’s a SaaS solution or onsite implementation software, and you can count on regular licensing implementation and yearly maintenance issues. You still need analysts, managers and directors to solve the problem, because the software platform is only presenting you the data. Someone has to still solve it, like every other software solution. The second traditional solution is going with an outsourcing company, which is a headcount game. They will say, “You have 50 people working chargebacks and deductions. You can eliminate 10 people from your department and hire 20 people in the outsource location, for 1/4th the cost.” So it’s either a software management solution, or a headcount solution. iNymbus comes from somewhere completely different. You just give us the data, we'll solve the problem and charge you per the transaction. There is no licensing, there is no implementation, there is no yearly maintenance of the software, and there is no headcount game. It is purely transactional and we just get it done. 4. How would you explain iNymbus in simple terms to a non-tech person? The big term we use is “cloud robotic automation.” We use elements of cloud, elements of robots, and automation, to use software to automate tasks. These three things work together to achieve something where there is no human touch involved. We consume and operate on data to resolve deductions into valid, invalid and not determinable. 5. What do you think the biggest promise of AI is, and how will it change everything? The biggest promise of AI is it can boil the ocean. But it cannot. The word AI is being abused a lot. Solving deductions doesn't require AI. Solving what they call a purchase order process or a procurement process is not really AI. When something is heavily automated, it is being called AI. But truly, there are only two use cases in which AI is being used. One is image data processing, like in self-driving cars. The cameras keep watch and convert into data, and operate on the data. The second use case with AI is with deep learning, where the data is being visualized into images, such as a trend graph, so humans can understand the data better and be able to make better decisions. If you talk to the top AI professors and the top AI book writers, they all agree that there are only two use cases. AI can't do magic in the world of deductions or in the world of advertising, for example. It’s all algorithms and configurations and that kind of stuff. The actual big promise of AI is literally to produce something and not need a human. The machine should be able to understand the context, operate on the given data, and take a suitable action, just like humans do. But humans can't do it fast or consistently enough. The promise of AI is that it can solve both of those problems. 6. What do you think the biggest threat of AI is? The extreme case is without humans knowing, AI is determining, “I need to bomb a country.” Another extreme case in a more simplistic world, is AI deciding we shouldn't be doing business with a company. For example, Capitol Records, when they used to be the leader of music in Los Angeles and sell a lot of CDs and DVDs. They were selling to Walmart even when they were bleeding to death, because of the relationship. It was important for Walmart to keep Capitol Records alive until they figured out what the alternative was when iTunes came in. There was a period where financially it didn't make sense, but for music and the social sense it totally made sense to stay in business. Eventually Walmart had to write off Capitol Records balance sheet on whatever they owed them. But in the case of AI, it wouldn’t have looked at those factors at all. It is not going to understand the social impact of cutting the business off. Looking at the data, AI won’t be personal, but more mathematical. Humans might not like the decision after the decision has been made, and there is no deliberation. Humans certainly won't like it if they disagree, and then we all have to live with that decision. 7. What are your favorite online website or resources that you check every day? Amazon is my favorite site, I will tell you why. Because Amazon is a Google for products. If I am interested in a product, even if it's something simple like a shoe, I go to Amazon and start comparing the features and looking at the reviews. Amazon gives you a huge database of competing products, with reviews and a sense of market size. So Amazon is still my favorite site and I enjoy passing the time browsing it. I also use a website called MetaCritic a lot. It decides what entertainment I watch, whether it is a movie or a TV show. As for tech articles, obviously I read headlines of EnGadget and Gizmodo. If I have time, I look at Wired, but these are only for headlines, I’m not reading articles. Then rest of my world is basketball. I don't do ESPN or NBA.com, but I go to Catalyst Sports or Second Spectrum. I would say the readership there is probably in hundred thousands, never touching a million. That's my world [laughs]. 8. How do you keep your technology skills current? Mainly University papers. Newly released MIT or Carnegie Mellon papers have the highest ratings in the computer science world. When I hear of one that gets a lot of citations, I know it’s bubbling up, so I read it. Usually it is a lot of hard work reading those papers, because it is a lot of geek speak, and usually about AI trends or machine learning trends or virtual reality, VR trends, or AR trends. These are the only four trends which are in vogue right now. People are trying to figure out how to apply these four to solve business problems. The important thing to know is these papers are usually seven or eight years ahead of business application. AI and machine learning papers probably started surfacing around 2005/2006. But it's just catching up now. I never rely on popular articles, because those are not to solve a problem, they’re for entertainment. 9. What qualities do you think are most important in a startup leader? There are three qualities. The first is the ability to create a product, whatever that is. The second is to figure out the product-market fit. Is there a need for this product in the market? That comes with age and with how much you have interacted with the world. It directly correlates to how many people you have talked with in this world. It's as simple as that. Did you talk to people for 5,000 hours or 10,000 hours? The effectiveness is very straightforward and correlated. And the third quality is the ability to distribute that product and finding various channels to so. I would say very high brilliant people figure all three of these parts out by the time they are 45, and now they are billionaires. That’s the perfect start up guy. Seldom you get them. One in million. However, there are some people who actually luck out. For example, Twitter and Facebook, they lucked out. Right time, right place, right thing to do. They didn't even know. Jack Dorsey and Mark Zuckerberg didn't have a clue that they were shaping the world opinion, and they definitely didn't have that much wisdom to crack through the society. It just happened. Before Facebook, there was something called Social Net. The founder had the same idea, but it was the wrong time. 10. What is your favorite technology product and why? Least favorite? My favorite technology product used to be email, because it revolutionized the world. Now it is Twitter. But unfortunately, it's also disappointing. With Twitter, you get all the information in 140 words. It's information on steroids. You don't need to spend too much time to know what is happening in any part of the world. You want to know what is happening with a tsunami in Indonesia? You read 10 tweets and you’re done. You get a picture and can form an opinion. It has revolutionized the way information is distributed at lightning speed. And it’s actually helped in many disaster zones, and helped everyone react immediately. At the same time, Twitter is also a medium where you can throw abuse without skin in the game, without any remorse, without any fear, without any consequence. It has been a fascinating product for both reasons. I am really in love with Twitter, but at the same time, I'm really disappointed with it. Being a geek, I have never used Android because I started with iPhone and I stuck with it. It satisfies everything I need. It is very predictable and it looks good. Sure, I need to buy another Apple product to stream YouTube onto my TV, but I don't need to geek out to make something work, it just works. Mac or PC? Any day, Mac. 12. Can you tell us about a tech project that you've worked on in your spare time? It’s been awhile, almost 10 or 12 years. We had a local streaming server for the movies between 20-25 friends. All of us had DVDs. The reason I started it was because of Indian movies were not available to all of us. Then it became a huge project to also include personal videos and any Hollywood movies. So we figured out a way to load them into our local computers, and created a local network using a software called Hamachi. All of us could choose movies from the catalog as if it existed on our own computer. It took a month to set it all up. Then Netflix came out, and we were done. 13. What was the most significant presentation you gave, to who, and about what? The most significant would be to 20 executives at Warner Brothers when I was trying to sell iNymbus to them. It was a huge step for them, because first they had bought software, and then they outsourced the function to Poland. Now I was asking them to do something revolutionary and they had to buy my trust and everything. It was significant because they had previously made investments twice, and I was trying to ask them to change again and do something completely different that nobody has done. 14. What was the last show you binged watched? The Marvelous Mrs. Maisel on Amazon Prime Video. Two kids; a boy who is 12 and a girl who is 10. 16. How do you manage your work life balance? The way I operate is I get up whenever I have to, sometimes that’s 5AM because of east coast time. I wind up my work typically by 3PM, because I want to give attention to my children between 3PM and 5PM. Then if I have work, I do so after 7PM for a couple of hours. I think I do a pretty good job of work-life balance. I never get agitated that I am working more, because I spend enough time with kids in the afternoon. 17. What do you like to do when not working on or thinking about iNymbus? Typically the only time I’m not thinking about iNymbus is when I'm with children and they're playing basketball games. They’re both very active, competitive basketball players. So it does take some time for us to take them to tournaments, watch them, give them feedback, give the coaches feedback, arrange for special coaching sessions, and all that stuff. It’s a big, beautiful part of our life. No pets … I can’t take care of myself. 19. What does iNymbus or yourself do to help altruistically? We tend to spend a little time in the local dementia center in Santa Monica. My dad has dementia. It gives a vicarious sense of helping since I am not able to attend my dad, but I am able to spend an hour with somebody in conversation. 20. What are the next major challenges for iNymbus or for you? 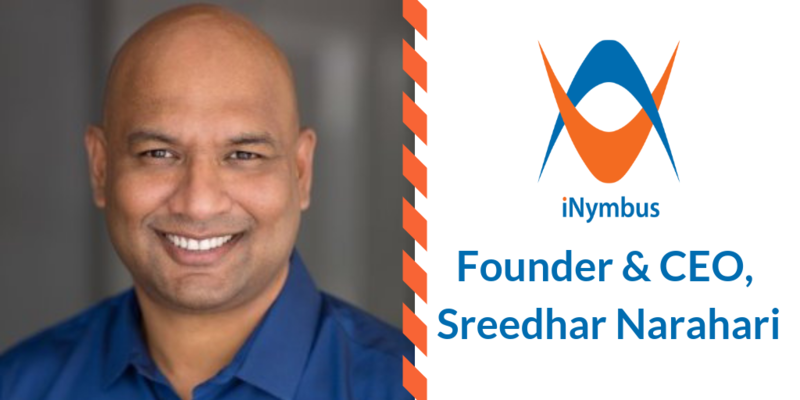 I’ve touched on this, but the biggest challenge for iNymbus is to establish the product-market fit. To show people that this is the way to go. Compared to the alternatives, not only is iNymbus the latest and greatest, but this simply the right way to go -- cheapest and fastest. We're getting there. Once that happens, there will be an explosion. Then, execution when the explosion happens is probably the next biggest challenge for me.